This was an evening of good and bad but little in between. 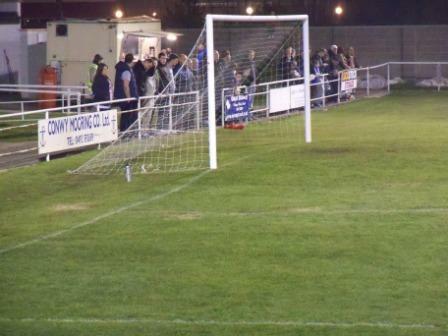 One of the most picturesque grounds in the Cymru Alliance is wasted on an evening match, as the looming cliffs aren’t so spectacular as looming shadows – definitely one to visit in the daylight. To add to the lack of backdrop, only half the stadium was accessible, the large covered stand behind the goal and down both sides to the half way line was out of bounds, with stewards stationed on both sides to stop entry. 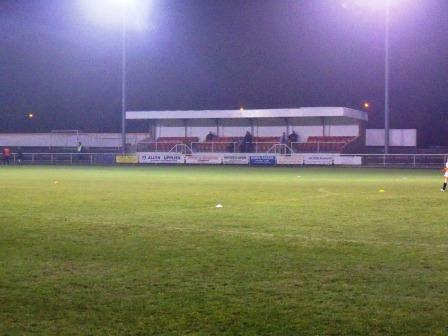 Only having access to 50% of this large ground for the Cymru Alliance, was very disappointing. To balance the scales slightly Y Morfa sold Douwe Egberts coffee! After 30 years of drinking chiccory-mixed sludge and thousands of cups of boring old Nescafe (a coffee that hasn’t changed since it was market leader and the nation’s favourite in the early eighties, despite there being a coffee revolution in the nineties when Britain realised that there was actual haute qualite coffee to be had and every make surpassed Nescafe by miles, even Supermarket own brands; but it keeps going because of brand-loyalists – the marketer’s dream), or worse Mellow Birds, Conwy United provided the surprise of the evening, with a five star coffee and for only 50p. It’s like going down to a market cafe and finding Foie Gras on the menu. I bet they don’t even have Douwe Egberts at Dutch stadiums. Conwy United have only been going since 1977, when Conwy Town and Conwy Borough Legion from the Vale of Conwy League merged. They had great success, being founder members of the Welsh Premier League in 1992 and finished in 3rd in 1995/96, thus qualifying for the Uefa Intertoto Cup, where they played Charleroi and SV Reid. They earned a respectable 0-0 draw with Charleroi. 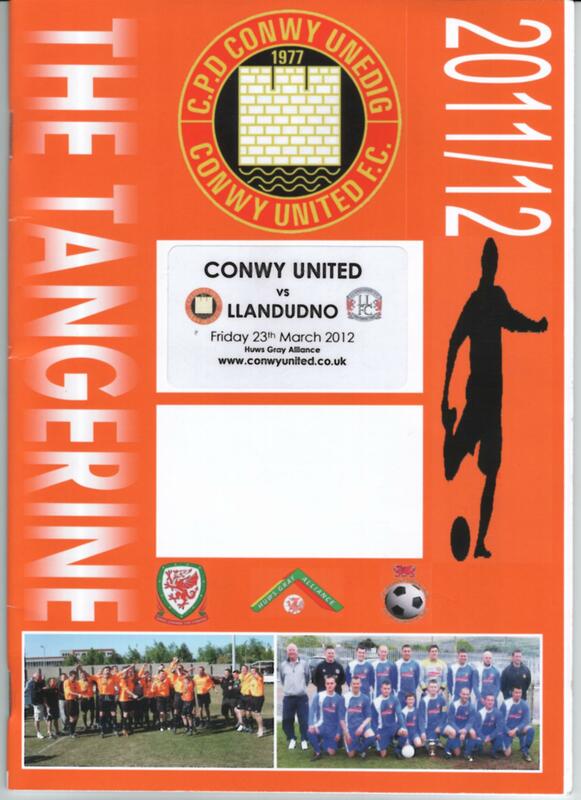 Previous to Conwy United (now Conwy Borough as from the 2012-13 season) they was the team Borough United, who themselves played in Europe in the Cup Winners Cup in 1963, but then folded in 1967. There has been a Conwy club of some sort since the 1870s. In recent times the club has fallen down the Welsh pyramid, playing in the third tier Welsh Alliance until last season, when they were promoted. With their stadium, they were very big fish in the small pond that is the Welsh Alliance, unusual in having stands and floodlights at all, let alone big stands. 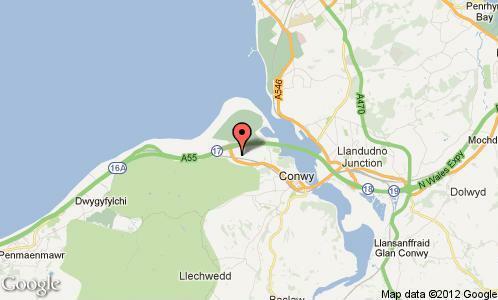 Conwy United’s Y Morfa ground is just a minute or so off junction 17 of the fast North Wales Coast road, the A55. It has a very plain look from the outside, with a uniform white wall enclosing the ground and as far as I could see no signs to say which club it was or the name of the ground, let alone upcoming league fixtures etc. 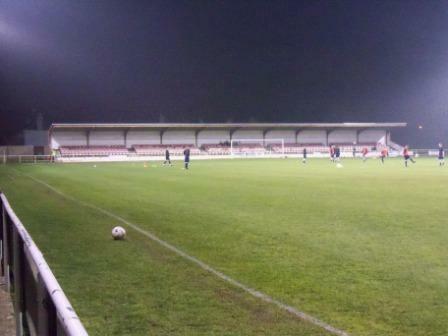 Inside there is one side that is a fair sized terrace, interrupted by a 200 odd seater stand. Behind the far goal is an impressive 400 odd seater stand, spanning the entire width of the pitch. This was out of bounds for tonight’s game, a great shame. The other long side had a double decker viewing gantry for officials and official photographers only, and a tiny shelter down the corner. The end you come in at is flat standing with the snack caravan with its superior coffee. Conwy United goals were the first I’ve ever seen at this sort of level of football with no back stanchions or triangles whatsoever. Only previously witnessed on school pitches or Sunday League, I was amazed to find these half finished goals laying host to a game at this level. Since promotion last term, Conwy United had consolidated their position in the Cymru Alliance, confortably in mid-table and local rivals Llandudno were a couple of places above them. On tonight’s showing Llandudno looked way more than a couple of places above them and they were far superior throughout the game, deservedly winning 4-0, with some great goals to boot. 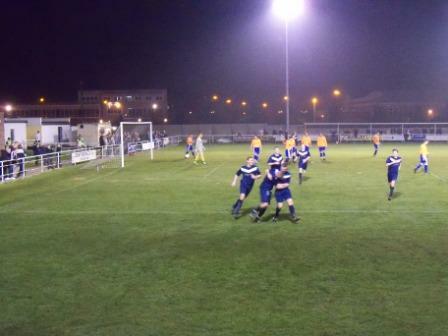 Most noticeably was their third, a mazy run down the left, a cut inside and a swinging shot from 25 yards that sailed over the keeper and in off the bar/post corner. Weirdly this was my first ever 0-4 scoreline. This entry was posted in Groundhopping, Travelog, Welsh football and tagged Conwy Borough, Conwy United, cymru alliance, Llandudno Town, Welsh football. Bookmark the permalink. please come back and see the newly refurbished stadium this season…unfortunately no dowe and egberts but thats an idea to think on. 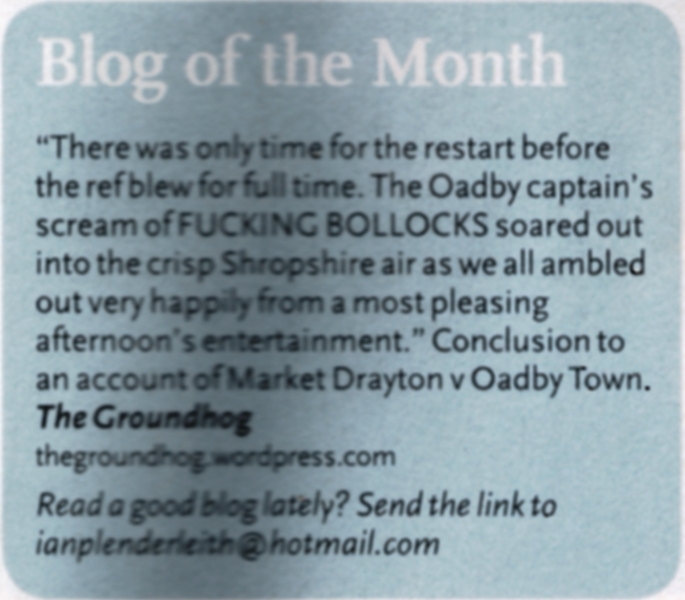 That’s a very generous offer – thank you. By the way, is there a number missing from your mobile? Conwy is a long way but I’ll try to get there. Can I be allowed up your TV Gantry!